µSQL is a SQL parser engine for C++ to develop SQL based applications easily, and it supports other SQL like domain specific languages such as UnQL and GQL too. Because µSQL is written only in old standard C++ library such as STL with ANTLR, then you can use it with many C++ compilers and platforms. Please check the following site to get the latest source code and check the doxygen documentation. To install µSQL, you have to the following package on your platform. µSQL use the library to run the parser which is generated by ANTLR. If you want to compile all examples of µSQL, you have to install the following packages too. On UNIX platform, you run the following commands to install the header files and library of µSQL. To compile the examples too, please add ‘–enable-examples’ option into the configure script. µSQL has some parser classes which are subclass of uSQL::SQLParser. For example, use uSQL::SQL92Parser to parse SQL92 statements as the following. The parsed statements are stored in uSQL::SQLStatement instances, the tokens in the statement are stored in uSQL::SQLNode instances. uSQL::SQLNode is a super class for all parsed token objects, and the parsed SQL statement is represented as a tree consisting of the subclass instances. The following example outputs all parsed tokens to a console. To get the target tokens more directly, uSQL::SQLStatement has some useful methods such as the getCommandNode() as the following. Actually, the parsed SQL statements is represented as a tree consisting of the subclass instances of uSQL::SQLNode as the following. µSQL includes the following useful sample applications to know how to use the APIs. The sample is a simple utility to parse input SQL commands. Using the utility, you can see the parsed tree visually as the following. The sample is a command line utility to cash query results of SQL databases such as MySQL using memcached. 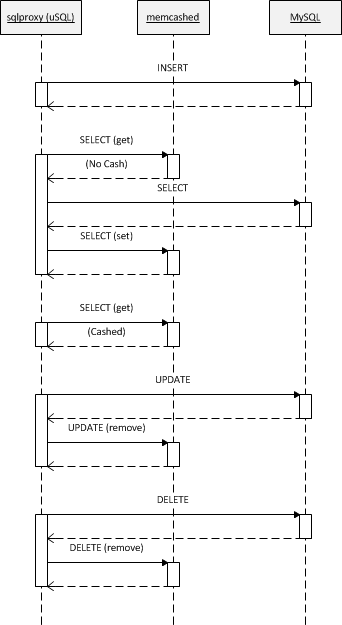 The utility runs as a SQL proxy as the following diagram. To cash query data using memcached, the proxy generates a key for memcached based on the table name and the expressions of the ‘where’ section in the specified SQL. Using the generated key, the proxy sets or gets the result data when SELECT command is specified, removes the result data when UPDATE or DELETE commands are specified as the following. The following is an example for using the utility. The sample is a command line utility for leveldb to operate the database using SQL commands like other database systems such as !MySQL and sqlite. The utility runs as a SQL proxy for leveldb as the following diagram. To execute SQL commands using leveldb, the proxy generates a key for leveldb based on the table name and the first expression of the ‘where’ section in the specified SQL as the following. The following is an example for using the utility to operate leveldb using SQL commands. µSQL is under development, then it doesn’t support all SQL syntax. I will support SQL92, !UnQL and GQL finally, but please check the syntax file of ANTLR directly if you want to know the current implementation state in more detail.